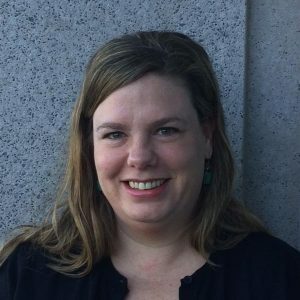 Kali McFadden is a senior research analyst at LendingTree and MagnifyMoney based in Charlotte, N.C., where she conducts data-driven studies of issues related to personal finance and economics. Over 700,000 Americans submitted personal bankruptcy filings in 2017, at an average clip of 60,000 per month. And these are just the new filings, which don’t truly capture the sheer volume of Americans who currently have bankruptcies on their records. Since 2012, 5.3 million Americans have added a bankruptcy to their records. Depending on which type of bankruptcy a person files (Chapter 13 and 7 are most common among individuals), a bankruptcy can remain on a credit report for seven to 10 years before falling off. Most lenders will consider a borrower’s bankruptcy history when they apply for new credit. There is a myriad of reasons why people might file for bankruptcy, whether it’s in the wake of a single financial catastrophe or after a long history of smaller financial missteps. There’s no question bankruptcy will negatively affect a person’s credit, but the difficult question to answer is just how crippling a bankruptcy can be on a consumer’s future borrowing potential. People who have declared bankruptcy (or who are considering it) may ask themselves whether they’ll be able to get a mortgage, finance a car or even get a personal loan down the road. To find out whether those fears are founded, LendingTree’s team of data analysts looked at loan terms offered to over a million anonymized LendingTree users in 2017. We then split the group into two categories — those who had declared bankruptcy within the last seven years and those who had not. Once we had those two groups identified, we compared the types of loan offers both groups received to see who got the better deals. The data set included individual users who inquired about a mortgage, automobile or personal loan. While a prior bankruptcy can make it more expensive to borrow, it’s certainly not impossible to qualify for credit, our findings show. And if borrowers wait to apply for new loans even just a few years after bankruptcy, they may find rates that aren’t too far off from what other borrowers are being offered. 43% of people with a bankruptcy on their credit file have a credit score of 640 or higher within a year of the bankruptcy. 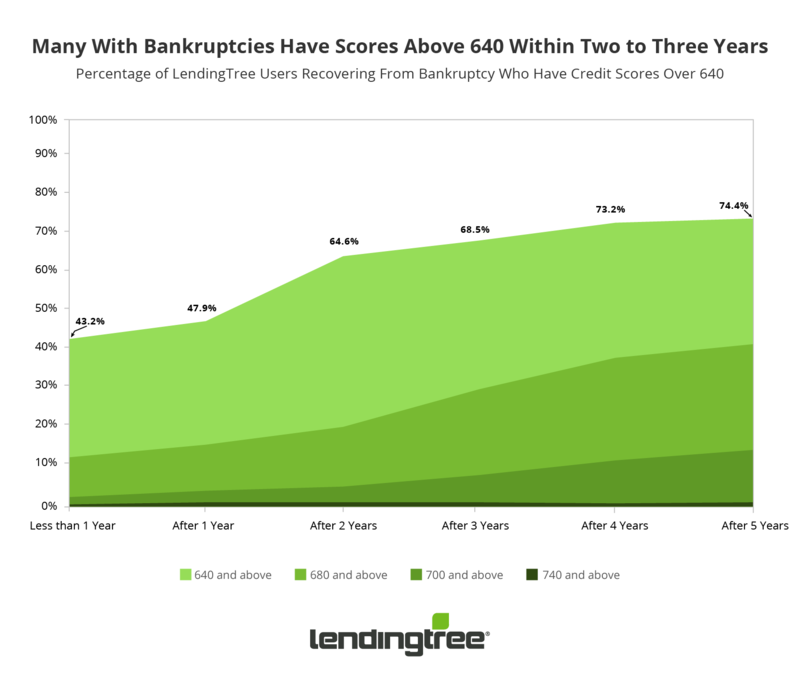 Within two years of bankruptcy, 65% have a credit score above 640. A typical $15,000 auto loan incurs an extra $2,171 in borrowing costs for those seeking offers less than a year after bankruptcy, but just $799 for those who wait at least two years after bankruptcy. Borrowers who have a 3-year-old bankruptcy and apply for a mortgage see an offered APR that is 19 basis points higher than those without a bankruptcy. The higher the APR, the higher your borrowing costs will be. Mortgage borrowers with scores between 720 and 739 three years after bankruptcy were offered similar APRs to those without bankruptcy, indicating a strong credit score can counteract the effects of a prior bankruptcy. Our research shows that after five years, about 75% of those with a bankruptcy on their record restore their credit scores to levels that are generally considered eligible for loans (640 and above). In fact, 43% of borrowers have these scores less than a year after bankruptcy, and after two years that percentage jumps to 65%. We even see a handful of users with scores over 740, even within one year of filing. “People may think that filing a bankruptcy would put you out of the loan market for seven to ten years, but this study shows that it is possible to rebuild your credit to a good credit quality,” said Raj Patel, LendingTree’s director of credit restoration and debt-related services and products. That said, there’s no denying that people who have declared bankruptcy tend to have lower credit scores than those who haven’t. Often, that damage may occur before they even file for bankruptcy, especially if the impetus for filing stems from their inability to meet their debt obligations. Average scores were 640 within a year of bankruptcy, and increased each year to 672 five years after. This compares with the average of 692 among those who don’t have bankruptcies on their records. On the whole, those who declared bankruptcy have lower credit scores than those without a bankruptcy, and those borrowers will pay more over the lifetime of a typical loan for that diminished credit profile. 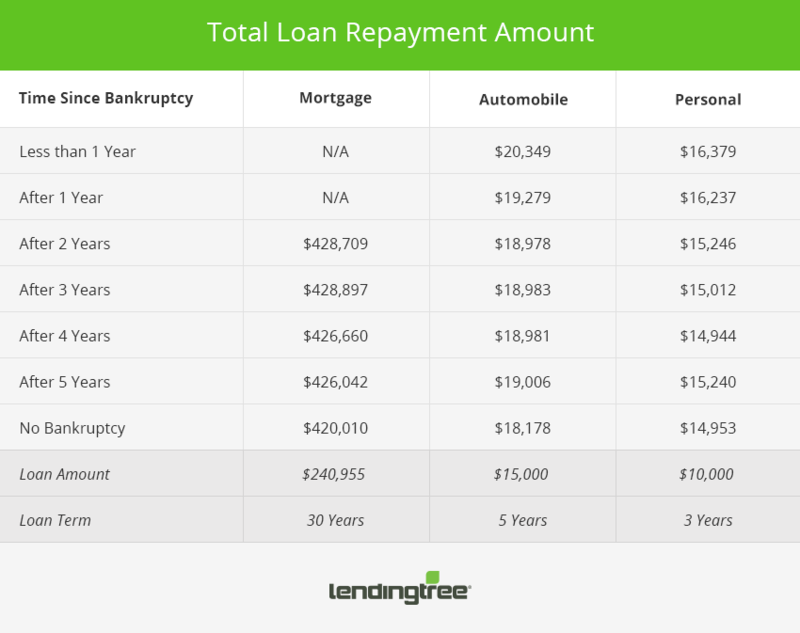 Average terms offered to someone three years after bankruptcy on a typical mortgage cost $8,887 more than the terms offered to someone without a bankruptcy. The terms get more favorable later on, however. Five years after bankruptcy, terms on a typical mortgage would be just $6,032 more costly than terms offered to someone without a bankruptcy. It’s also important to recognize that mortgage lenders likely won’t make loans to anyone with a recent bankruptcy because Fannie Mae will not typically purchase mortgage loans of consumers who have been discharged or dismissed from bankruptcy in the last two to four years. Read more about getting a mortgage after bankruptcy here. 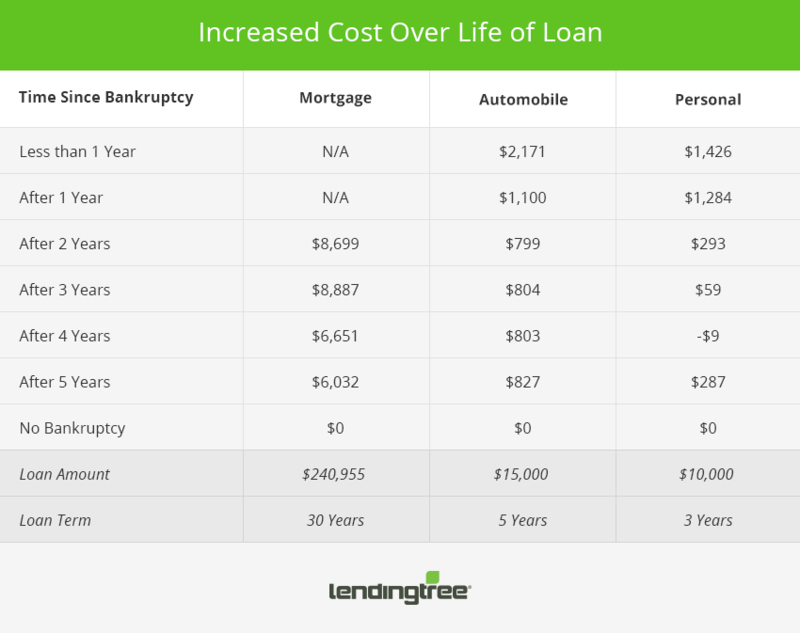 Among those seeking auto loans, those who are less than a year removed from bankruptcy are offered terms that, on average, will cost them $2,171 over the life of a five-year $15,000 loan. That drops to just $827 after five years. Similarly, among those seeking personal loans, borrowers who are less than a year out of bankruptcy can expect to pay, on average, $1,426 on a three-year $10,000 loan. After four years, they actually get better terms on average, saving $9, but it rises back up to $287 in additional costs at five years. The fact that people with bankruptcies get worse rates five years out than four years out could be due to a relapse in bad credit behavior, says Patel. “Falling behind on payments and excess credit utilization” can impede their progress toward improving their credit post-bankruptcy, he adds. When we compare both groups of users (those with prior bankruptcies and those without) who have similar credit ratings, we find that lenders offer them similar – and in some instances better – terms, which suggests that lenders aren’t demanding a premium just because someone had a bankruptcy in the recent past. A strong credit score may be enough to demonstrate that whatever issues landed that borrower in financial hot water in the past may have resolved. Three years after bankruptcy, some people with scores over 700 actually received better mortgage rate quotes than people with comparable scores who never filed bankruptcy. For example, people with credit scores between 720 and 739 were offered an average APR of 4.02% three years after filing bankruptcy. Those without a bankruptcy who had scores just as high were offered 4.04%. 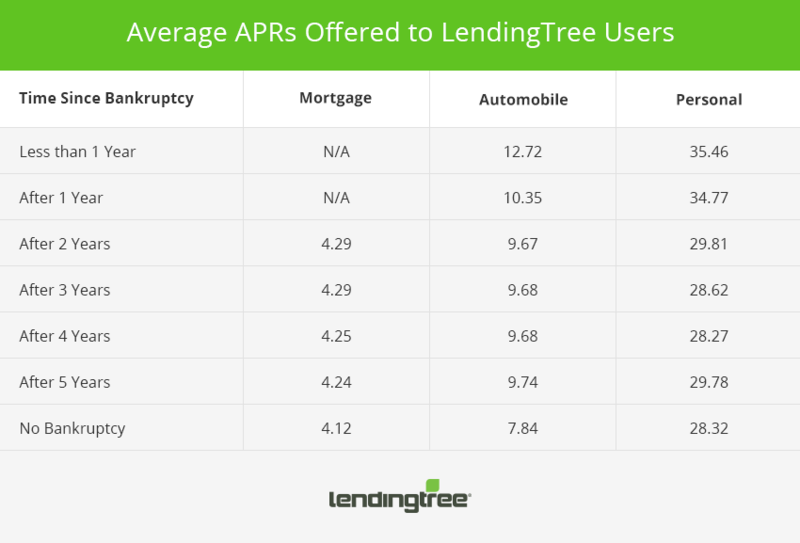 Among auto loans, people with a score between 720 and 739 received average APRs offers of 4.79% within a year of bankruptcy, 5.86% after three years, and 4.53% after five. By comparison, borrowers who never had a bankruptcy received an average APR offer of 5.07%. People recovering from a bankruptcy are in a similar position to anyone who needs to repair their credit standings. Based on our study, there’s no indication that people in the aftermath of a bankruptcy will have a harder time accessing credit than their peers who did not file for bankruptcy (except for potential mortgage loan embargos caused by the Fannie Mae policy discussed above). Some people may even find themselves in a much better position to recover, thanks to a reset of their debt-to-income ratios. “The biggest challenge in rebuilding credit is for the consumer to stick to a disciplined approach by getting access to the credit but sticking to a plan for not overusing the credit,” said Patel. The key is to use it responsibly — keeping balances low and making payments on time, which are two of the biggest factors that impact your credit score. There are many financial monitoring and advice services available from different companies, including LendingTree. A typical consumer should expect those services to be completely free of charge and make sure they are provided by a reputable company. Note: This content is not legal advice. If you are considering filing for bankruptcy, you should consider speaking to a lawyer. LendingTree looked at lending offers for a sample of over one million users who requested lender rate offers for mortgages, auto loans and personal loans in 2017. Individual users are presented with multiple offers from lenders, and these were averaged for each user. The mortgage loan amounts used for comparative calculations is the average mortgage amount reported in LendingTree’s Mortgage Offers Report for February 2018. What Is Automatic Stay in Bankruptcy? Does Bankruptcy Stop Wage Garnishment?